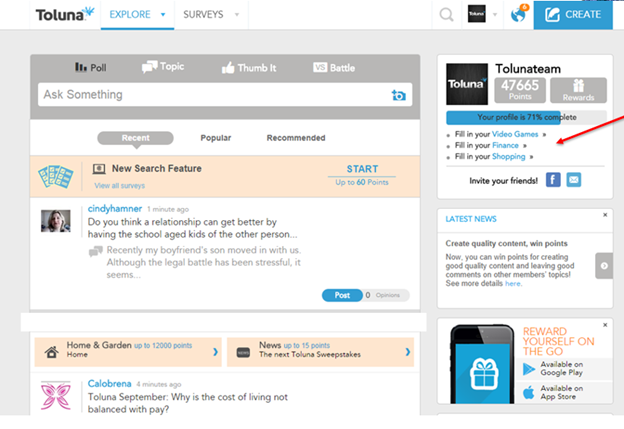 The Toluna community offers our members a chance to for our millions of members to express their opinions. In our series of “Toluna Essentials” we’ll go over all the techniques you can use to get the most out of your experience with Toluna. Let’s go over the Toluna Homepage. Once you login to the website, you’ll get a screen that looks like the picture above. If you look on the page as a whole, you’ll see content that is highlighted in a salmon color. For example, here you see a bar labeled “New Search Feature” for up to 60 points and also below that “Home & Garden up to 12,000 points”. These are little reminders that you’ll see as you scroll down the page looking through member’s content. You can choose to take the survey, and also continue to scroll down the page and participate in people’s content like the topic cindyhammer created. To participate, just click the “vote” or “post” button in blue on the content. All content is categorized by recent, popular and recommended. The recent content will stream the latest posts created by our members. Popular content is a collection of all the high quality posts with the most participants. Recommended content is a collection of 15 point surveys from our Quick Votes accounts. The upper right corner is where you can see how many points you’ve earned, along with your profile surveys. See where it says “fill in your video games, finance” – those are profile surveys *quick tip* I suggest you fill out as many profile surveys as you can because they are worth a couple hundred points each and they let us match you to available survey opportunities. Underneath you’ll see a section called “Latest News”. This section will present our most recent blog posts, as well as announcements. Under Latest News, that you’ll see that Toluna is available on the go via mobile apps for iPhones and Androids. Download the free app to take surveys and create content right from your mobile or tablet device. 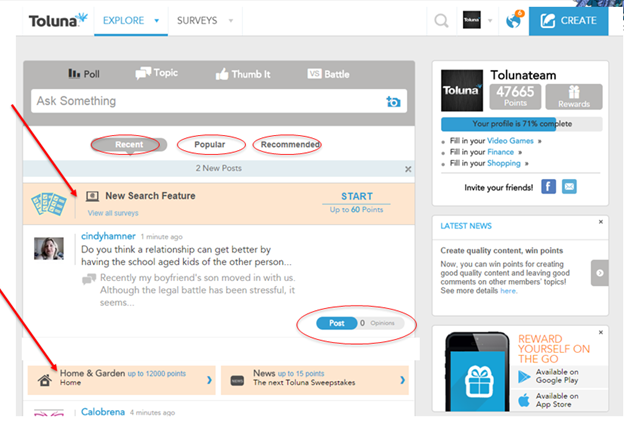 Please keep in mind that not all surveys on Toluna.com are mobile device compatible, so you may not have the same selection on mobile as on the site.